Leonie Noirot and her two sisters came to England after they lost everything they had in France. They successfully opened a dress shop, with each of the sisters contributing her own talent, Leonie’s being taking care of the business end. Recently both of Leonie’s sisters have married titled gentlemen, and she feels the necessity of keeping the business operating successfully. One of the ways she does this is to show up at public events, turned out in clothes from the shop, enticing young ladies to come there to purchase their own outfits. At one of these outings, she is quite taken with a painting, and is lost in admiring it, not realizing that a handsome gentleman is lost in admiring her. This man is Simon Blair, Marquess Lisburne, and he owns the painting. Simon begins a conversation with Leonie, and it seems he is also cousin to a lady named Gladys, who Leonie very much wants to design a wardrobe for and “make over.” Gladys is not a beauty and dresses all wrong, and Leonie feels she can make her desirable, and even gain her a marriage proposal. Simon doesn’t think so, and this eventually leads to a wager – if Leonie wins, she gets the painting. But if Simon wins, he gets Leonie for two weeks. Before the bet can be decided one way or another, Simon and Leonie begin an affair. She has no expectations, after all, he’s a marquess and she’s just a dressmaker. She is also determined to keep her head and enjoy it while it lasts, and most importantly, not to fall in love. They have an explosive chemistry together, and despite her resolve, Leonie soon realizes she has fallen. Simon, who had only planned on staying in town for two weeks now can’t bear the thought of giving Leonie up. This is a delightful story without a lot of conflict (at least not for the hero and heroine – a few minor characters had some serious drama.) I find it really refreshing to read a book that just lets the characters fall in love. This was a quick and delightful read, and I recommend it. 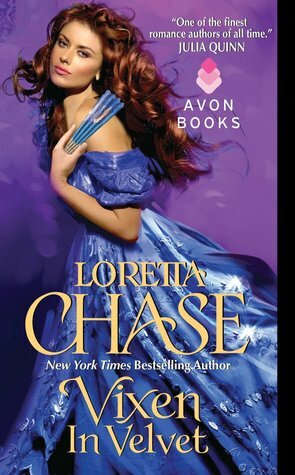 Rose, Loretta Chase is one of my favourite authors and this has been a delightful series.